When you think of Director Jonathan Demme who has done some serious dramas and documentaries pairing with writer Diablo Cody who did the fabulous Juno, one would expect a little something more than the light confection of ageing rock star wanna be confronting her middle American family life that she left behind. Cody based the story on her mother in law who fronted a bar band for years. 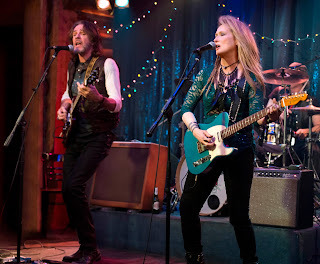 Meryl Streep and Kevin Kline help elevate the light script with some nice turns by Mamie Gummer (Streep's real life daughter) and rocker/actor Rick Springfield. What makes this film more interesting than it is would be the music. Streep plays Ricki, the lead singer in the Salt Well bar band in Tarzana that plays covers to a small but loyal group of regulars. Ricki wears thick makeup and freaked out hair, dressing younger than a woman her age would normally be attired. During the day she's a cashier at a uppity food store where customers purchases are more than she makes in a week. She lives in a run down apartment and dates the lead guitar player in the band, Greg (Rick Springfield), but she is wishy washy about making a commitment with him. She gets a call from her ex-husband Pete (Kevin Kline) who informs her that her daughter Julie (Mamie Gummer) is having a melt down as her new husband left her for another woman. His current wife Maureen (Audra McDonald) is in Seattle taking care of her father, and he thinks that Ricki, whose real name is Linda, should come and offer emotional support. Using the last of her money she flies to Indianapolis making Pete pay her cab fare as he lives in a fancy home in a gate community. Ricki had left her family of Julie, Adam (Nick Westrate) and Josh when they were little to pursue her dreams of being a rock star. She loves her kids, but she hasn't really had any contact with them for years and now they are all grown up still harboring resentment to their mother who abandoned them. Julie who hasn't bathed or changed out of her pajamas for days now blows up at her mother's return. Even meeting her sons for dinner is a dysfunctional family disaster with Josh admitting that they were not going to invite her to his upcoming wedding. Somehow she kinda gets an understanding with Julie before Maureen comes back and tries to use her grown up voice to let Ricki know that it's “her” family now. Ricki goes home resigned to accept that life she has chosen. The last part of the film ties up nicely with the family finally appreciating what Ricki is doing what she loves and that's all she has to give to them in a Bollywood style dance party. While this melodrama makes one uncomfortable with Ricki's arrested development, she really loves playing music and performing. And her band of ageing musicians are better than any bar band out there. They include the late Rick Rosas on bass, Parliament-Funkadelic’s synth-pioneer Bernie Worrell on keyboards. Streep looks like she if having the time of her life singing and playing guitar. It's a mindless piece of fluff, but fun to rock and roll.